How Long Do I Need to Wear My Invisalign Braces Each Day? If you’ve researched Invisalign, you know that the aligners you’ll wear are removable. But does that mean you need to wear them all day long? That will depend in part on the personal instructions you receive from Dr. John Robison or Dr. J.D. Robison. In general, though, the answer to that question is yes. 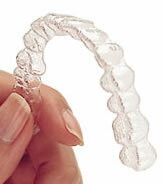 For Invisalign to work efficiently, pressure needs to be applied to teeth for at least 22 hours a day. So, when should you take your aligners out? To eat or drink, and for brushing and flossing. As a result, Invisalign lets you enjoy the same kind of diet you enjoyed before you started treatment. Plus, by taking your aligners out for brushing and flossing, patients are able to clean parts of their smile that would be harder to clean with bracket-and-wire braces. In some cases, you may be able to take your aligners out for special events. This might include a night out with friends or a special date. But to achieve the results you want in the average treatment time of 12-18 months, it’s best to wear your aligners for the recommended amount of time each day. Do you want to learn more about how Invisalign can help you enjoy a straighter smile without the need or metal brackets or wires? Call Robison Dental Group to schedule a consultation with Dr. John Robison or Dr. J.D. Robison. Our dental team serves patients from Canton, Ann Arbor, Northville, Westland, Plymouth, and beyond. Comments Off on How Long Do I Need to Wear My Invisalign Braces Each Day?